Asian Attraction is a striking slots game from the prolific development team at gaming giants Novomatic. There has been an explosion of Asian-themed slots on the market in recent years, and this is certainly one of the more enjoyable. Lots of developers take the easy option of imitating other successful slots, but Novomatic has a reputation for always developing original and high-quality games across a wide range of themes. Read our full review below. Novomatic is one of the biggest online slots developers in the world. The company has hundreds of much-loved slots available in casinos in a number of countries. One of the older of the big online gambling software providers, the company was originally founded around 40 years ago. Thanks to its talented team and reputation for innovation, the company soon became one of the biggest names in the business. Novomatic initially concentrated on designing, building and supplying slots machines to land-based casinos. The main market was European casinos, but Novomatic soon expanded into other countries around the world. The late 1990s saw the internet take off and revolutionise gaming forever. Novomatic, as one of the earliest developers to embrace this new technology, soon released a number of successful slots into online casinos. Today, the company is responsible for some of the most played online slots games in the world. You'll find titles from Novomatic in hundreds of casinos, and the company caters to all tastes, budgets and playing styles. We have a vast collection of Novomatic slots covering a huge variety of themes and genres. Of course, all of these and our slots from other providers are available to play completely free of charge. You won't win any real money, but you'll be able to try out some of the most successful Novomatic slots of all time and see what all the fuss is about. As with most Novomatic slots games, this one is easy to play. Experienced gamers will love that they can jump in right away without changing a lot of fiddly settings, and new players will find it simple to pick up, even if they are completely new to online slots. The minimum bet on most sites is 40p, but of course here at Slots Temple it's completely free to play! The game has five reels, which is standard and the number most slots have. There are 20 paylines, and you'll need to land winning combos across these in order to scoop a prize. Begin by setting your bet, keeping an eye on the total bet amount displayed to make sure you select a sum you're happy with. Once you've decided how much to bet, you can hit the spin button and watch the reels go. There is a useful autoplay feature for players who prefer to set up their spins in advance and then sit back and watch. Of course, you don't even have to sit and watch if you don't want to - the autoplay feature will keep the reels spinning in your absence until all your spins are used up or until you choose to manually stop the function. Like all the best slots, this one has some fantastic special features to keep you on the edge of your seat as you spin the reels! There is, of course, a free spins feature, which is a staple of most slots you'll find at online casinos these days. This is one of the most popular special features, and the one most players look out for when assessing whether they want to play a new slots game or not. In order to trigger the free spins feature, you will need to land three scatters across the reels. The scatter in this game is a stunning pink lotus flower. The scatter can appear anywhere across the five reels and doesn't need to appear on adjacent reels or start from the leftmost reel. It also doesn't need to appear on the set paylines in order to trigger the special feature. Three of the scatter awards you 10 free spins instantly, giving you lots of chances to land some nice big wins. The free spins come with some extra treats, too. You'll notice there are lots of stacked symbols on the reels, giving you plenty of opportunities to get some multiple combos on the paylines. Keep an eye out too for the geisha on the centre reel. If this appears, it can upgrade other game symbols, increasing your payouts and giving you a better chance of scooping bigger wins. The maximum number of spins that can be awarded is 16. You'll also get an instant win just for landing the scatters. Three scatters will net you 2x your total bet, four will get you 20x your total bet and landing five scatters anywhere on the reels in a single spin will scoop you an impressive 50x your total bet. And, remember, this is all before your free spins have even started. If you're an experienced slots player, you'll probably be wondering what the game's variance is like. It's a mid- to high-variance game, meaning you will likely experience periods of play where it feels like you've gone a long time without a win. This might suit players who enjoy the thrill of high-variance games, as well as the knowledge that a huge win could be just around the corner. If you prefer to play lower-variance games where you tend to win little but often, you might find this game frustrating. Having said that, if you're playing for free here at Slots Temple, there's no problem, so you might as well try it out anyway to see what you think! Here at Slots Temple, you can play this and any of our other fantastic slots completely free of charge! We don't require you to enter any personal info or provide your payment details before you enjoy any of our great slots. If you're looking for free slot machines with free spins, you will find it hard to find a better offering than ours. We pride ourselves on our huge selection of slots, including hundreds of the world's most played titles. The online casino market has really taken off in the past few years, and it's not unusual to see ads for casinos splashed across TV, radio and internet. There are so many thousands of slots games out there that it can be overwhelming and hard to know which one to play first. We make it easy for new players to try out some of the best slots games on the market, all completely free. We also love to welcome experienced players who are looking to try out newer titles or perhaps re-discover old favourites they'd forgotten all about. You'll enjoy all the same great game play and will be able to see all the free spins and other special features that you would get with paid play. Probably one of the biggest and best known of the Asian-themed slots out at the moment is 88 Fortunes. This is a ground-breaking slot produced in collaboration with Bally, the iconic casino brand. It caused a huge stir when it was first released on to the market due to its innovative gameplay, stunning design and its incredible win potential. As well as paying out some very generous prizes to lucky players in the base game, it also has a fantastic free spins feature. Not only that, but there is also a jackpot feature. This isn't a progressive jackpot, so you're unlikely to win any life-changing sums here - unless of course you adjust your bet to a higher level, boosting the jackpot totals. Having said that, the jackpots are pretty decent, and you'll notice the chance to win them crops up fairly regularly compared to a lot of other slots with in-game jackpots. There is a mini, minor, major and grand jackpot. The size of the jackpots depends on your total bet, so the bigger your bet, the larger the jackpots will be. The jackpot feature is triggered randomly when a wild lands anywhere on the reels. Once this feature has been triggered, you are guaranteed to win one of the jackpots, which is pretty exciting! In order to determine which jackpot you get, you will be invited to choose from a selection of gold symbols. Each symbol will reveal a symbol relating to one of the four jackpots. Once you have revealed four matching symbols, you will be awarded to corresponding jackpot. Another big hitter, this striking slots game is highly popular with players all over the world. It's an incredibly glitzy and eye-catching slot and certainly stands out from the crowd, no matter what site it's on. Like 88 Fortunes, this game also has four jackpots. Unlike 88 Fortunes, however, this slot has progressive jackpots. This means there are some truly spectacular prizes available if you manage to strike it lucky. Not only that, but there are two different ways in which you can win a progressive jackpot. This is highly unusual, as anyone who has ever played a progressive jackpot slots game will know! There is also a free spins round which is triggered whenever you land three scatters. This is a truly stunningly designed game and will appeal to anyone who loves to play Asian-themed games or who just wants to be in with a chance of scooping an impressive progressive jackpot. Be sure to check out Fu Dao Le slot if you fancy a bit of excitement! Another slot with an Asian theme, this fantastic yet simple game from Playtech is always exciting to play. There are just nine lines, meaning the lowest bet amount is just 9p on most sites. Despite the low minimum bet, however, this game can pay out some great prizes. The free spins feature is one of the best out there, but you'll need to land two bonus symbols - one on the leftmost reel and one on the rightmost in order to trigger it - and it can sometimes feel that this doesn't happen as often as it should. Once you've triggered the special feature, however, you could be in for a surprisingly large win if you're lucky. Rather than instantly award a set number of spins, the game invites you to choose ninja symbols to determine how many spins you will get. You will also be able to increase your multiplier. Simply click ninjas one at a time. Some will disappear to reveal a multiplier, while others will reveal extra free spins. There are also magic ninjas that make a handful of other ninjas disappear, revealing more free spins and multipliers. Beware, however, of the evil ninja. This one doesn't disappear when you click on it and instead ends your picking session and begins your free spins! With a high multiplier and a decent number of free spins, it's possible to land some great wins in this game, even if betting at low stakes. In the early days of online slots, players could only play on their desktop PC or on their laptop. Since the advent of smartphones and tablets, however, the gaming market has exploded, and it's now possible to play on a whole host of devices. There's no need to download any software or apps to play our slots, including Asian Attraction. All you need to do in order to play on your phone, tablet or other compatible device is open your usual internet browser and launch the game. No matter which platform you choose to play on, you will experience the same engaging gameplay and same great special features. 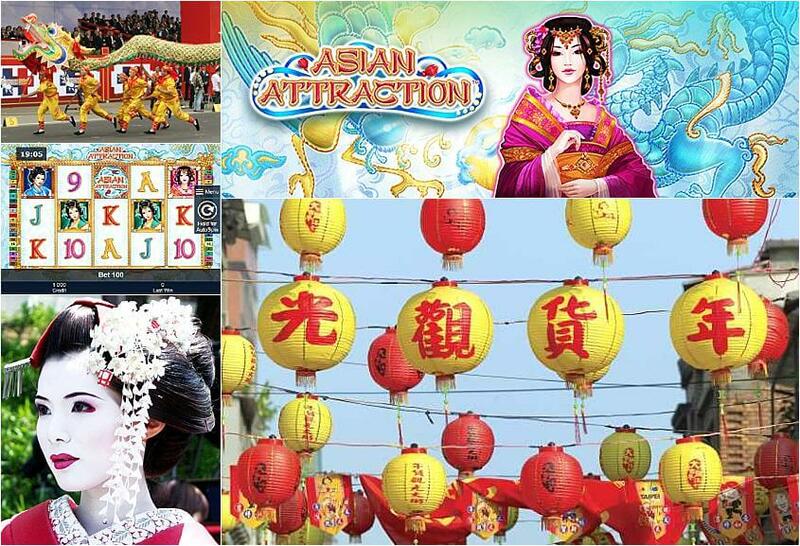 * Asian Attraction trademark / license is owned by Novomatic. This site is not endorsed by Novomatic.